Description: A Shottky field emission transmission electron microscope fitted with spherical aberration correctors on the probe and image-forming lens systems. This instrument is capable of imaging atomic structures with a resolution of less than one-tenth of a nanometre. At the same time, it can acquire chemical information selectively from just one or two atomic columns. 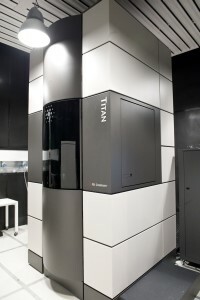 The microscope configuration includes electron tomography for three dimensional imaging of structures and an energy imaging filter for composition and bonding measurements. Technical Configuration: FEG-TEM/STEM; Operates at 80kV, 200kV and 300kV; SuperTWIN pole piece; CEOS CESCOR probe Cs corrector; CEOS CETCOR image Cs corrector; Fischione Instruments 3000 annular dark field STEM detector; FEI DF4/Quadrant DPC STEM detector. FEI DF2/ABF and BF detectors. On-axis Gatan 805 BF/DF detector; Bruker 60 mm2 retractable windowless SDD X-ray detector and analyser; Gatan Tridium 863 P image filter; FEI EMPAD direct electron detector (128x128); FEI CETA 16M (4kx4k) CMOS camera; 3-axis piezostage, high stability tomography goniometer; Gatan 636 Double tilt cooling holder; Gatan HCHTR3000 Double tilt He holder; Fischione Instruments 2020 ultra-high tilt tomography holder; Fischione Instruments 2040 Dual-axis advanced tomography holder; Fischione Instruments 2050 on-axis rotation tomography holder; Protochips Aduro/Fusion, 4 channel, Double tilt heating/biasing holder.